There are so many great wines being produced these days it is difficult to keep up with them all. That’s what happened when I tried the Charles Krug Merlot ($24-26). I loved this Napa Valley wine and meant to write about it for Merlot Month back in October, but got sidetracked. Luckily, I take good notes when I taste a wine, so I can remember what it tasted like. This lush, expressive merlot is everything you could hope for in a merlot. It starts with inviting aromas of ripe fruit with some hints of spice. Blackberry, plum and cherry flavors are wrapped in medium tannins, so you get a firm body without the tannins overpowering the fruit. The wine has a rich, warm mouthfeel, with juicy fruit flavors coating your mouth. The flavors linger through a long, smooth finish. Charles Krug Winery is the oldest in Napa Valley, and it has been owned by C. Mondavi and family since 1943. So they know something about making the kinds of wines people like. It all starts with great grapes, and the Mondavis have 850 acres of vineyards in prestigious areas. This merlot was produced from all estate fruit. It is 82 percent merlot, 15 percent cabernet sauvignon, 2 percent petit verdot and 1 percent malbec. The blend changes every year, giving winemakers a chance to pull the best from each grape in the mix. After fermentation it spent 17 months in French and American oak, giving the wine some body and power. If you don’t keep your wine in a cool place, put this merlot in a refrigerator for about 15 minutes before serving. By the time you pour it and drink it, the wine will be about at cellar temperature. Winery: Charles Krug Winery is acknowledged as the oldest commercial winery in Napa Valley, dating back to 1861. It also has California’s first tasting room, opening in 1882. Founder Charles Krug was a Russian immigrant, bringing with him many wine industry innovations such as the cider press and selection of rootstocks and vineyard sites. Krug was one of the pioneers of the modern California wine industry, constantly preaching about how important quality was. He died in 1892 and James Moffitt held the property until he sold it to Italian immigrants Cesare and Rosa Mondavi in 1943. With their sons Robert and Peter, the Mondavis built Charles Krug into one of Napa’s powerhouses. Cesare died in 1959 and Rosa became president of the winery, Robert became general manager and Peter vice president. In 1963 the winery became the first in Napa Valley to use French oak barrels for aging. 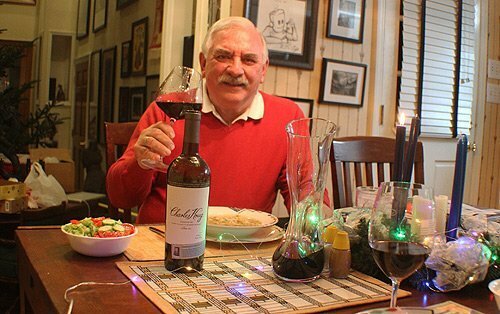 In 1966 Robert broke away to build his own winery in Oakville, Robert Mondavi Winery. Robert was an innovator and also built his winery into one of the area’s powerhouses. Peter became president of Charles Krug when his mother died in 1976. By 1999, the Napa Valley Vintners Association had named him one of 12 living legends for such innovations as research on cold fermentation, aging in small French oak barrels and planting Chardonnay and Pinot Noir grapes in the Carneros region. Peter’s sons Marc and Peter Jr. assumed the stewardship of the winery when Peter Sr. died in 2016. The brothers have six children between them, and some of them have shown an interest in continuing the family winemaking tradition. The family continues to bring innovation to the winery. In 2013 a new tasting room and visitor center opened. More than 4,000 solar panels are deployed to provide power. They produce wines in several layers of quality, focusing on Chardonnay, Sauvignon Blanc, Cabernet Sauvignon, Merlot and Pinot Noir. About 74 percent of the family owned vineyards are planted with Bordeaux varietals. Sustainable and organic farming practices are employed on most of the family’s vineyards. The family also has the CK Mondavi label, which produces well-made value wines in the $8-12 range. Goes with: We had this with a rich chicken noodle soup on a chilly night. Both the wine and the soup hit the spot. I like soup all year long, but especially on cold, dark nights. When you add a glass of good wine, you get the perfect cozy fall or winter meal. The rich fruit flavors of the wine perfectly blended with the savory flavors of the soup. Each one made the other better. You might not think a red wine would be right for chicken soup, but this soup is so rich, it can handle a mellow red like this merlot. The soup is simple to make. It is basically a dump soup where you cut up all the vegetables and put them in the pot together with broth. I start with a whole chicken and some extra breasts or thighs, boiling them for at least an hour. Then I remove the chicken, being careful to strain out all the bones and small pieces. Then I dump the vegetables into the broth while the chicken cools. I usually put in diced onions, celery, carrots and green onions. Sometimes I add parsnips. I usually chop up some parsley to add near the end, and sometimes I’ll put in fresh thyme. I always add extra bouillon or Better Than Bouillon, a kind of chicken paste that comes in jars. When the chicken cools chop and shred it into bite-sized pieces and return it to the soup pot. I usually serve this soup over noodles, but I also serve it over brown rice or wild rice. The soup tastes better if you make it a day or two before serving. Something happens when the soup sits in the refrigerator with all the flavors blending and mellowing. 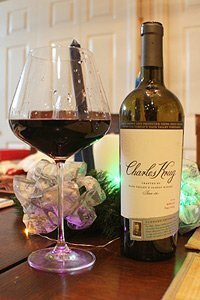 The Charles Krug merlot also would go well with duck, lamb chops, chicken and dumplings and many rich, creamy cheeses.